Home / Who is Who / Who was the First Female Prime Minister of Pakistan? Question: Who was the First Female Prime Minister of Pakistan? On the basis of the democratically elected timeline, Benazir Bhutto achieve the post and honor for being the first female prime minister of Pakistan. 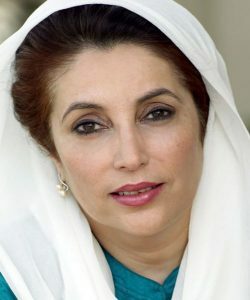 Pakistan’s Benazir Bhutto was hence the first democratically elected female leader of the Muslim country. Her ruling power in Pakistan finally came to an end with the assassination. She was the daughter of during a tumultuous life that ended with her assassination. The daughter of Pakistan Peoples Party (PPP) founder and Prime Minister Zulfikar Ali Bhutto! She took over the chairperson post of the PPP in the year 1982. She was born on June 21, 1953, in Karachi, SE Pakistan. However, she pursues the higher education in the United States. From 1969 to the year 1973, she attended Radcliffe College, and then she attended Harvard University from where she attained B.A. degree in comparative government. She then went to the United Kingdom to study at the place of Oxford from 1973 to 1977. At that place, she finished her course in International Law and Diplomacy. Do you know how was the first female Foreign Minister of Pakistan?